Once again it was a very entertaining, highly readable installment. Book 5 in the Downside Ghosts series moves at a great pace, with the action revolving around tainted drugs and an army of ghost-infused junkie zombies. Awesome 🙂 The last 25% of the plot is a constant rush. Chess and Terrible’s relationship is developing just fine, thank you very much. Of course Chess is insecure like hell and Terrible is a tad too jealous for his own good but overall I am not tired by them, not yet.Thankfully, Terrible and Chess haven’t turned into the one of those boring book couples like Cat/Bones, Mercy/Adam amd Sookie/Eric.There is a strong focus on their relationship throughout the story. Working together, you get to see the respect, pride and absolute trust that they have for each other. Lex is an annoying piece of gangster crap but I hope he’ll stay that way because I wouldn’t like to see any evil love triangles, nuh huh. What’s more, Chess is one of the most unlikely heroines you will ever read about in any sort of romance, not just urban fantasy. She’s a liar, a cheat, a junkie. She’s arrogant, stubborn, impulsive, and full of self-loathing and self-sabotage. She just can’t cope with bad (and most good) feelings so she turns to drugs to block everything out. She might annoy you from time to time but she’ll never bore you. What really makes this series, however, is Ms. Kane’s ability to make the reader actually care what happens to all of her characters. It’s not just Chess, and Terrible, and for some readers, Lex and Blue. It’s the Elders, Bump, even some of the minor characters that we meet in pipe rooms and back alleys. It seems the Church won’t see any honest-to-gods competition any time soon and I do lament that fact. I am also not very satisfied with Chess’s opponents – so far all of them have been a bunch of evil losers who had dabbled in dark magic because they were power-crazy, greedy b******s. A nice, three-dimensional baddie, somebody for whom you might feel a tiny amount of sympahty, would really make me happier. Bump? Are you ready for your new role? I am keeping my fingers crossed. Apart from that let me tell you just this: after five installments full of Cesaria’s adventures in the Downside Wonderland I feel it’s time to change the formula a bit because it is getting old. In every book there was plenty of trouble occurring in Downside, and of course Chess was expected to solve any magical issues that had arised, and of course they somehow affected her legitimate working life not to mention her pill-taking habits.I suppose it’s high time for some real problems catching up with our girl. I hope Chess will at least realize that her drug addiction, getting worse and worse, is something which has been steadily ruining her life. The most epic battles usually you fight with yourself and let me tell you, dear Cesaria, I suppose your turn has come. A great UF series but I think being on the brink of changing, for better or for worse.I cannot wait for book six to come out but it might be the last one to be read by me. I hope for the best of course, I have a feeling Ms Kane is going to a certain direction with Chess’ development and I like that heroine and these books, I really do. Still there comes a point where it gets just a little bit dull and if it doesn’t change soon I might ditch Chess after all. 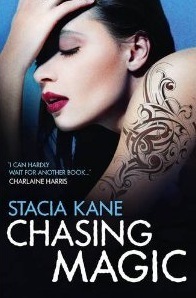 This entry was posted in book review, paranormal, romance, suspence, urban fantasy and tagged Stacia Kane. Bookmark the permalink. I hasn't gone bad, not yet. But, unless Chess's approach to her drug addiction changes in the next installment, I might be ditching it. Great review Bridget, thank you. You do encourage me to start reading this series. My pleasure Aurian. Looking forward to your review! Yup, every series has a shelf life (so to speak). This one has been going on for a while, it seems like. Definitely. If the author wants to keep at least one part of her faithful readers interested, it's time for changes.